It’s easy to wake up in late September and wonder where your summer went. Luckily, we’ve scouted 18 trips—the exact number of weekends between Memorial Day and the official start of autumn—for you to pack in as much fun as possible. Visit a comedy festival in Bloomington, pedal your way Horse Country, go off the grid in Hocking Hills, camp out at a NASCAR race, or choose from 14 other adventures. Hey, summer’s fleeting. If you don’t stop and look around once in awhile, you might miss it. This beautiful Southern city celebrates its martial past as summer kicks off. Summer Sunrise: A view of Savannah’s Talmadge Memorial Bridge. At first blush, this dreamy Southern belle might not seem like a fightin’ town. But Savannah has layers on layers of military history. And during Memorial Day weekend, the military and police communities come out in force to remember the city’s role in conflicts past. Some of the most visible reminders are from the Revolutionary War (the city was British-held right up to the end). In fact, just 10 years after the decisive Battle of Yorktown, President Washington visited, then followed up with a gift of two bronze cannons captured from the British. 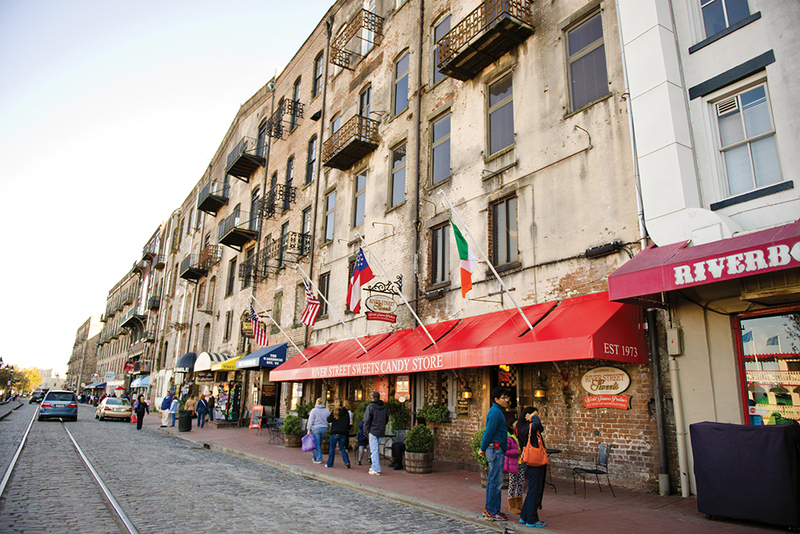 The “Washington Guns” sit on Bay Street, steps away from the footbridges and ancient stone staircases of the cobblestone riverfront—itself a living snapshot of ye olde Savannah. To see this site and much more, head over to Rousakis Riverfront Plaza on historic River Street for the Armed Forces Festival (May 25), a full day of patriotic merrymaking to help fund the Georgia National Guard Family Support Foundation. 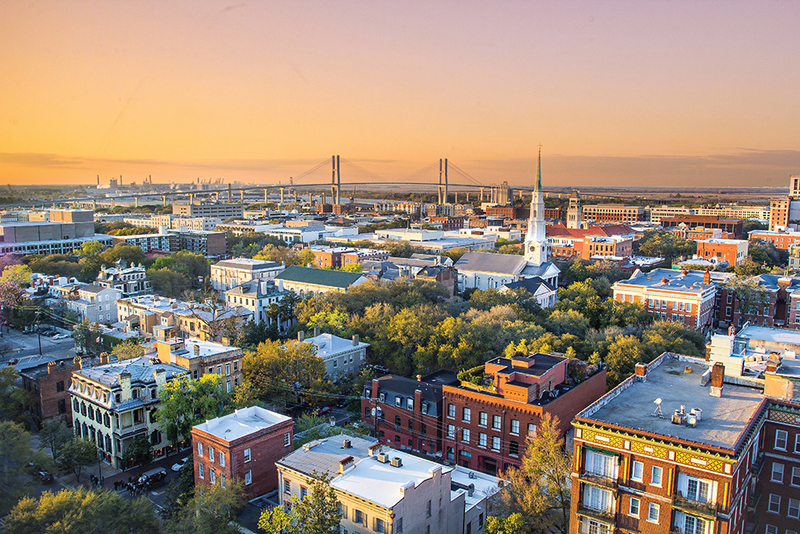 Despite its location in the deep south, Savannah takes much of its identity from its role outside the Civil War: The local lore goes that General William T. Sherman couldn’t bring himself to burn the beautiful city, preserving it as a “Christmas gift” to President Lincoln. And yet the war between the states is remembered in nearly every corner of the city, with cannons, statues, and forts a-plenty. Visit Sherman’s former headquarters, now known as the Green-Meldrim House, take the Civil War Savannah Tour, or simply walk through the city’s 22 historic squares. Photograph by: (bonaventure cemetery) Bonaventure Don. 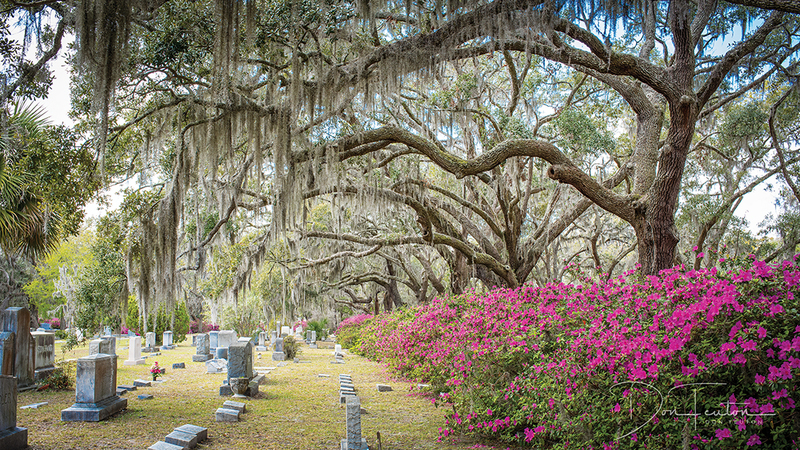 If you need an excuse to visit one of the world’s most famous cemeteries, plan to attend the Chatham County Memorial Day Ceremony (May 26), hosted by the Savannah-Chatham Metropolitian Police Department, at Bonaventure Cemetery. You’ll quickly see why it’s one of the most photographed places in the world (most famously for the cover of the book Midnight in the Garden of Good and Evil). Of course, Savannah memorializes contemporary wars, too. The Vietnam Veterans Memorial, also on historic Bay Street, is unique in its simplicity: Inside a small pool sits a marble stone in the shape of Vietnam inscribed with the names of local men and women who fought and died in that war. It’s a peaceful corner that inspires deep reflection. Visit the memorial during your weekend to see a performance by the Third Infantry Division Band Brass Quintet at the Savannah VVA Memorial Day Ceremony (May 25). College town charm and plenty of laughs. Since 2013, the Limestone Comedy Festival has brought in a slew of well-respected comics to Bloomington, Indiana, a beautiful (and in the summer, blessedly empty) college town. Headlining this year’s lineup is W. Kamau Bell, who’s best known for his political comedy and CNN show United Shades of America. How excited are you to visit Mike Pence’s home state? I’ve actually been to Indiana three or four times since the election, and I lived there as a child. So I’m familiar. There’s this thing called the Midwest, but Indiana is mostly the South. John Cougar Mellencamp may have good Midwestern values, but he’s more country than Motown. Is there a goal or theory that drives your comedy? Usually I’m investigating some idea I don’t understand. Comedy is a way to explain the world to yourself and to explain how you see the world to other people. Setting sail (or not) on Lake Erie. Put-in-Bay, a village on South Bass Island in Lake Erie, northwest of Sandusky, will be a busy place the weekend of June 10. In the wee hours of that Saturday, sailboats of all shapes, sizes, and speeds will glide into the bay, completing the annual Mills Trophy Race. If you’re not up for watching the boats arrive in the middle of the night, no worries—you can see the entire racing fleet in all its glory the next day at the downtown docks. Follow in the footsteps of movie stars in Mansfield, Ohio. 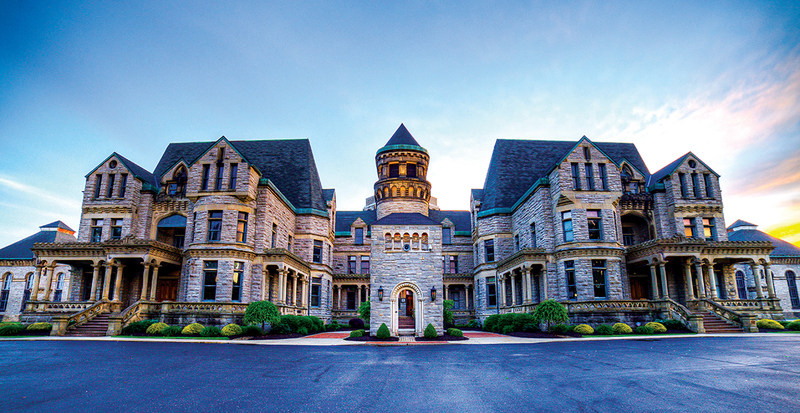 The Ohio State Reformatory in Mansfield. Fly through an exhibition of presidential aircraft in Dayton, Ohio. You can see it on their faces. Somewhere around the Holocaust exhibit, visitors realize that they’ve spent so much time with the exhibits about Wilbur and Orville and the beginning of flight that their day at the National Museum of the U.S. Air Force is nearly over and they’re still nowhere near finished. If that’s you, you owe yourself a return trip to the world’s largest military aviation museum. And this time, start in the museum’s new fourth building. Because the $40.8 million expansion, which opened last summer, shouldn’t be a rush job. The 22,400-square-foot space houses 10 presidential aircraft, including the Air Force One that carried JFK to Dallas, and Sacred Cow—the plane that took FDR to the Yalta Conference in 1945. Seeing the compact room where the polio-stricken president huddled with his wartime staff, it’s easy to summon the intensity of that era. There are also historic moments represented by the military’s workhorse aircraft: Hanoi Taxi brought the first American POWs home from Vietnam. On the way: Slather on the sunblock: the Vectren Dayton Air Show (daytonairshow.com) is back. The annual aviation extravaganza this year includes the U.S. Air Force Thunderbirds; an F4U Corsair demonstration; an all-female skydiving team; and the country’s newest fighter, the pricey F-35 Lightning II, performing a “heritage flight” with a WWII warbird. It’s a chance to see your tax dollars and your grandfather’s war bonds at work together. Get swept away by the beauty of nature. 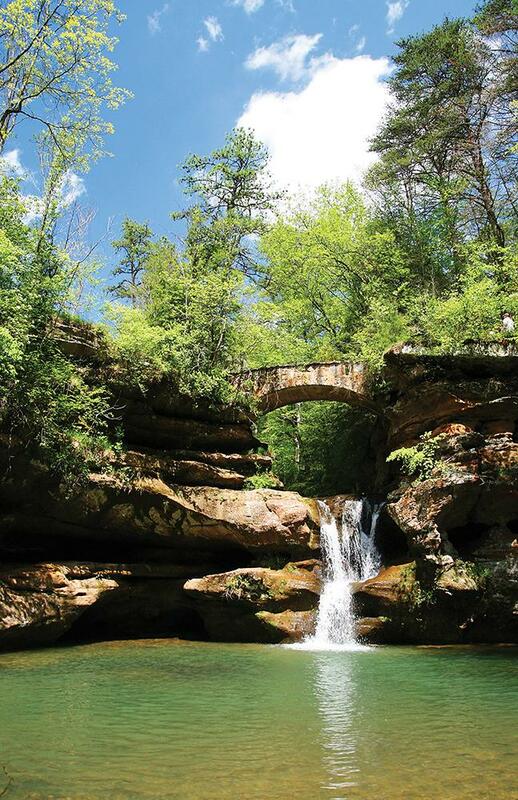 On the way: Hocking Hills not your jam? Try Vinton Furnace State Forest (forestry.ohiodnr.gov/vintonfur nace), a “state experimental park”: 12,000-plus acres of rare plants, cool birds, bobcat rumors, and even old Belgian coke ovens. Adams County’s mysterious, fascinating Native American earthwork Serpent Mound (arcofappalachia.org/visit/serpent-mound) is Ohio’s very own Stonehenge. 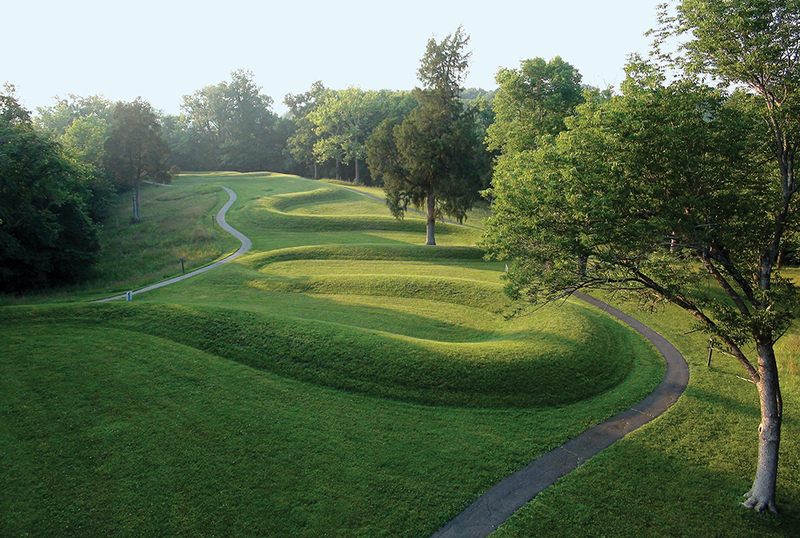 Serpent Mound in Adams County. Up in the northeast corner of Ohio, beautiful and unlikely rock outcroppings covering 167 acres in Nelson-Kennedy Ledges State Park (parks.ohiodnr.gov/nelsonkennedyledges) form maze-like trails weaving through moss-encrusted rock walls and opening onto sun-dappled forests. Go ahead—go out on a ledge. This is how you camp at Kentucky Speedway. Dave Yeary and his wife Kris have been traveling to Kentucky Speedway since it opened in 2000, including all six of the track’s annual NASCAR Cup Series Quaker State 400 races. The Green Township native shared his veteran insight in advance of this year’s green flag on July 8. Finding hope in a complicated, horrible history. 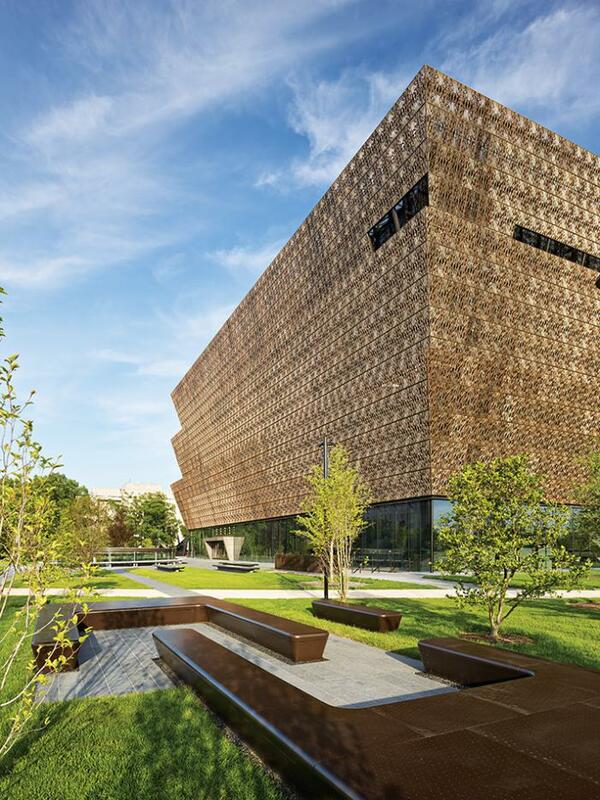 National Museum of African American History and Culture in Washington D.C.
Chasing the sun down U.S. Route 1. At about 6:30 on a Sunday morning, Las Olas Boulevard is silent. It’s too early for the typical mix of tourists and locals that bustle about Ft. Lauderdale’s swankiest street. In order to watch the sun rise over the Atlantic Ocean, though, this is the route to take. And that’s what you’re here to do: watch the sun rise, then chase it down U.S. 1 so you can watch it set in Key West. When you arrive at Ft. Lauderdale Beach, the obvious is made clear: The sun rises so…freakin’…slowly. When you’re about to start a 400-mile roundtrip drive with plenty of stops along the way, this qualifies as an inconvenience. So take a few pics for your Instagram feed, but don’t linger. It’s time to start the journey. Let us note that it is possible to fly into Key West, the southernmost island of the Florida Keys. There’s an airport and everything, but air travel robs you of a stunning, relaxing, and picturesque drive. Key West is the destination, sure, but traveling solely for that island is like eating only the cherry on top of an ice cream sundae. And no one loves maraschinos that much. So fly into Ft. Lauderdale, which has a more convenient and less expensive airport than nearby Miami. The crucial step is renting a set of wheels. Any car with power windows will do the trick, but springing for a convertible—whether it’s a Mini Cooper or a $3,000-a-day Ferrari—will be worth it. Beginning the day early is key. Not only will it be cooler, but the road will be more open, making the drive and its views even better. And don’t forget to fuel up the body. Before you hit the beach to watch that sun rise, head to Stork’s in the tiny inland isle of Wilton Manors and carbo-load with a breakfast pastry or a slice of strawberry rhubarb pie. Sleeping in? Grab a pork belly breakfast sandwich with pickles at The Foxy Brown. Then hit the road. The first main island you’ll encounter on U.S.-1, the only road you’ll need to reach Key West, is Key Largo, the same one name-dropped in the Beach Boys’ “Kokomo.” At 27 miles long, it’s the largest of the Florida Keys and after about 90 minutes of driving, it makes an excellent spot to dip your toes in the water. 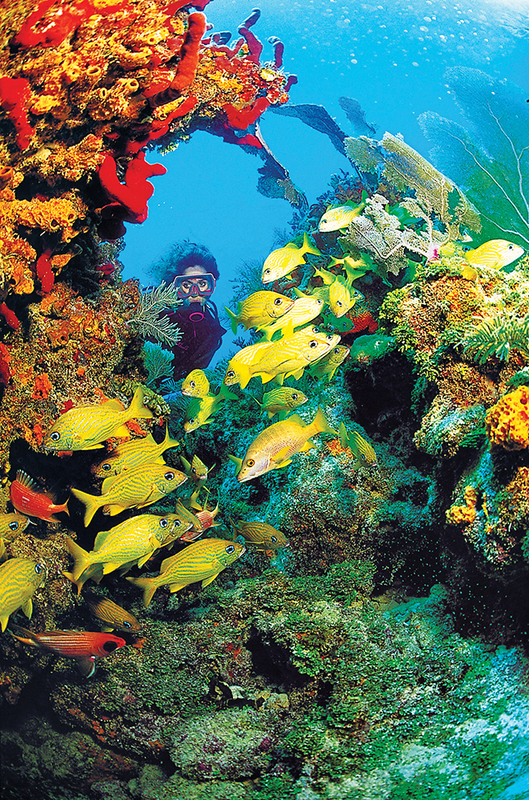 The John Pennekamp Coral Reef State Park has affordable options for all types of aquatic exploration, including glass-bottom boats, scuba tours, snorkeling, and stand-up paddling. I opted for the $12 per hour kayak rental and navigated the eerily empty mangrove swamp like I was Charles Marlow. Next, I made a pit stop at a church in Islamorada (it was Sunday, after all), but after that, the road opened up and the Overseas Highway came into full view. There are ostensibly 42 bridges connecting the 125-mile stretch of road to the chain of islands, but they aren’t elevated like the bridges we’re used to. It’s as if the water’s surface has been paved. You don’t have to crane your neck to get a view of it; you’re surrounded on all sides. Islands, approximately 1,700 in all shapes and sizes, dot the horizon, and boats toss up wakes on an otherwise calm sea. Driving along this remarkable highway, one of only 31 in the country designated an All-American Road, it’s almost easy to forget about that final stop. After traversing the renowned Seven Mile Bridge and swimming off the shore of Bahia Honda State Park, I drove the final 37 miles to reach Mile Marker Zero. Key West is known for its über-relaxed vibe, and a walk down Duval Street is all the proof you’ll need. Everyone in town seemed to act like they had just completed a 5K and were en route to enjoy a celebratory beer. Grab your first pint at Irish Kevin’s. The live music venue has a nice blend of old timers and twentysomethings, and it gets rowdy at night. The only drawback is that it’s entirely indoors. I was intent on drinking outdoors, so I tried Caroline’s Café, which has a comfortable shaded patio bar and bartenders who can whip up a stiff umbrella-topped drink. The island’s other known commodity is key lime pie. 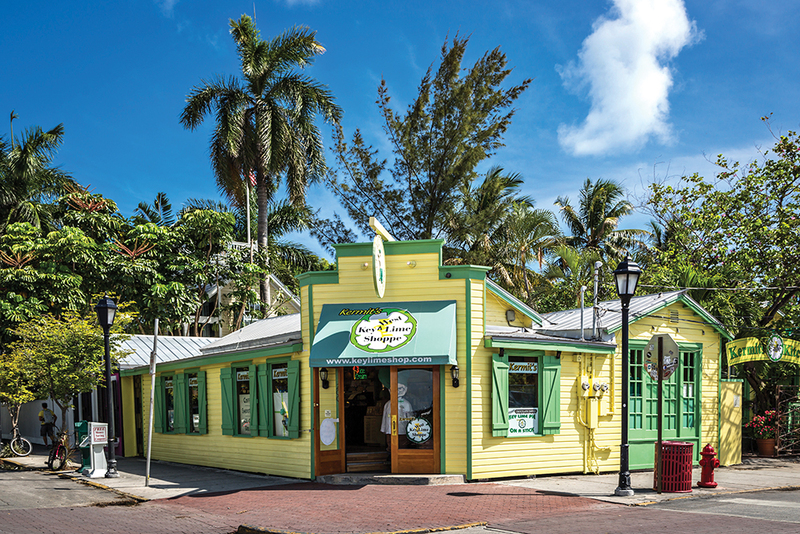 Though most key limes are not grown in the Keys anymore, there are still dozens of pie shops and homemade recipes in town. I opted for Kermit’s Key West Key Lime Shoppe, which delivers a wonderfully tangy and sweet slice. 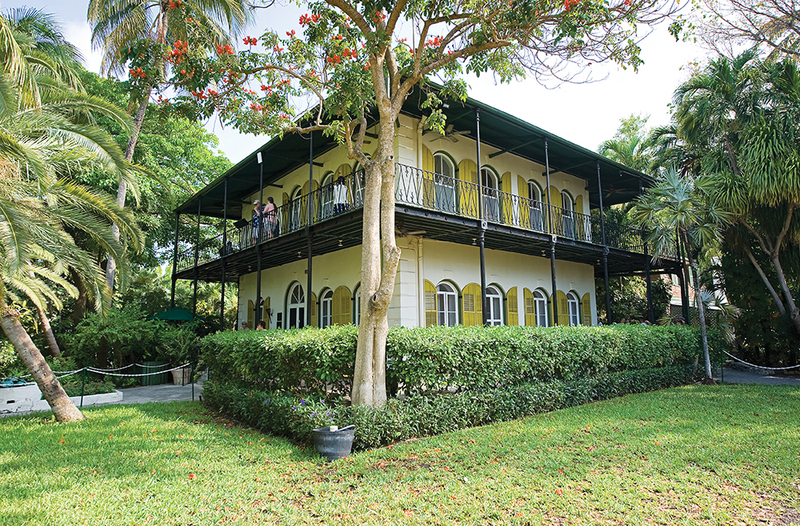 It is also conveniently located around the corner from the Ernest Hemingway Home and Museum, where the famous six-toed cats roam across what is still the largest piece of residential property in Key West. On the way: Scattered across Ft. Lauderdale’s seven-mile beach are plotted nesting grounds for loggerhead, leatherback, and green sea turtles. Turtle hatchlings emerge from these pockets each summer and crawl to the ocean; problems arise when they confuse street lights and high beams for moonlight. Organizations like Sea Turtle Oversight Protection (S.T.O.P., seaturtleop.com) work to save those that have gone astray. Register for one of S.T.O.P.’s turtle treks, and you can help guide turtle babies to the water. On the way: At Larkspur Press (larkspurpress.com), Gray Zeitz, the high priest of letterpress, and his assistant Leslie Shane print primarily Kentucky authors, including Wendell Berry, Bobbie Ann Mason, and Richard Taylor. The elegant hardbacks are available at fine bookstores, but to truly appreciate Zeitz’s Zen-like poetry in motion, book lovers should plan to attend the press’s open house in November for a glimpse of the antique presses and books being stitched by hand. A shopping trip where the journey is the destination. On the way: Celina-bound travelers can detour to New Bremen’s Bicycle Museum of America (bicyclemuseum.com), where the collection of nearly a thousand two-wheelers includes the country’s oldest bike as well as Pee-wee Herman’s red beach cruiser. Chattanooga, the birthplace of the tow truck, pays homage to its history at the International Towing & Recovery Museum (internationaltowingmuseum.org), home of the world’s fastest wrecker, a tow truck raced at speeds above 130 mph. Those are some hot wheels. 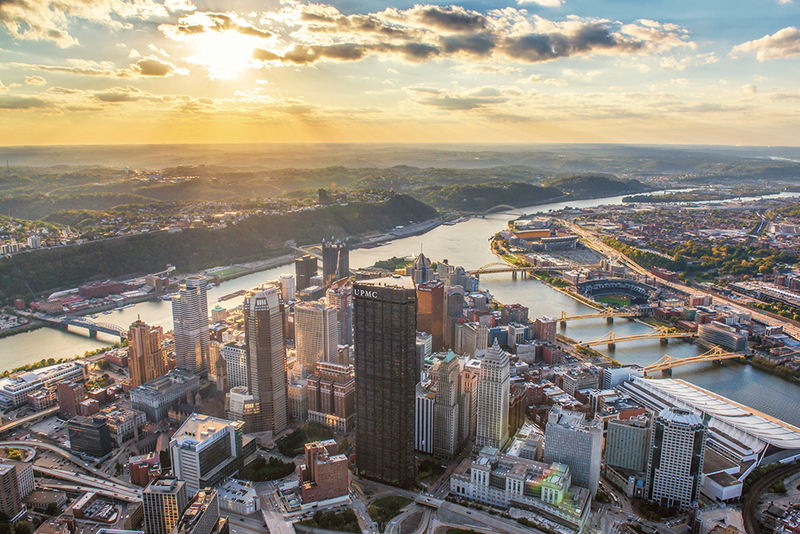 Amtrak’s Chicago-to-NYC Cardinal Line can whisk you to outdoor adventure and an under-the-radar food scene in West Virginia. Three nights a week, an Amtrak passenger train rumbles out of Cincinnati at 3:27 a.m. It passes the night skyline at a steady roll, across the Ohio on a trestle just west of the Clay Wade Bailey, then on through Covington. Before long any signs of city fade away as the route tracks the river’s south bank. Without city light, the reality of 4 a.m. sets in, and the gentle sway of the train rocks you to sleep—in blessed solitude, if you’ve sprung for the roomette rather than coach. But set an alarm to wake in time to catch the wilds of West Virginia in the morning light and the sit-down breakfast in the window-lined café car. At 9:41 a.m., the train stops in Thurmond. The smallest incorporated town in the country with a population of five (an active few: they have an official statement of inclusion that welcomes diversity), at first glance it’s barely a glance: just the yellow and red board-and-batten–sided train depot, a single-lane iron bridge, and the New River rushing by. But a short jaunt back alongside the train line reveals what remains of a once-booming coal town, with a National Park Service history exhibit filling the storefront windows and a winding road up to the homes that remain in the now-serene setting. 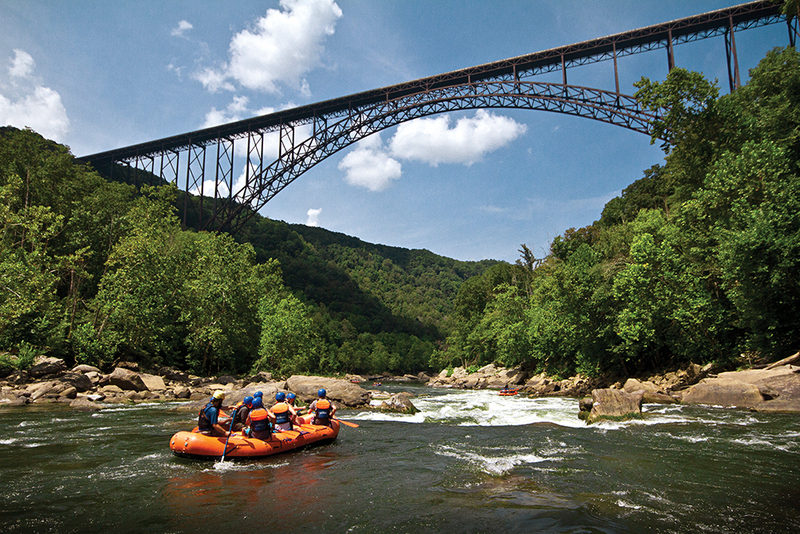 Thurmond sits within the New River Gorge National Park, a roughly 70,000-acre expanse that encompasses three rivers, 1,400 species of plants, hiking and mountain biking trails, and some of the country’s best whitewater—which, unlike out west, is warm. Each year 75,000 people run the river, and increasingly, it’s a destination for rock climbers with its water-cut sandstone faces home to more than 1,600 climbing routes. Cincinnati’s world’s-largest-small-town thing extends beyond city limits: The New River’s water flows west to the Queen City, points out Dave Arnold, a Terrace Park transplant who’s been in West Virginia since 1976, when he and his business partner Jeff Proctor (also from Cincy) got gigs as river guides. Two years later they opened a small outdoor outfitter, which has grown into Adventures on the Gorge, an adventure resort offering lodging from $15-a-night campsites to $1,200-a-night luxury homes; multiple on-site restaurants; a zipline canopy tour; and guided whitewater rafting, rappelling, paddleboarding, kayaking, biking, fishing, climbing, and caving tours. Arnold is also my ride from the station, a service AOTG provides for any guests coming by train; you’re not exactly in Lyft territory, after all. Lunchtime means Cathedral Café in Fayetteville, a perfectly eclectic spot owned by Wendy Bayes, a firecracker of a Miamisburg native who went to West Virginia for a summer guide job and never left. She now serves a locally sourced menu with killer paninis (like The Hypocrite, their vegetarian sandwich…with bacon), carrot cake, coffee, and wine to locals and visiting outdoor enthusiasts. Dinner, meanwhile, takes us to the original Pies and Pints, the proprietor of which came from Loveland, and which recently opened back home, too. The New River Gorge bridge, visible from the AOTG grounds, is iconic. (Need a refresher? It’s on the West Virginia state quarter.) You can raft below it, drive atop it, or walk the 3,030 feet across its catwalk. 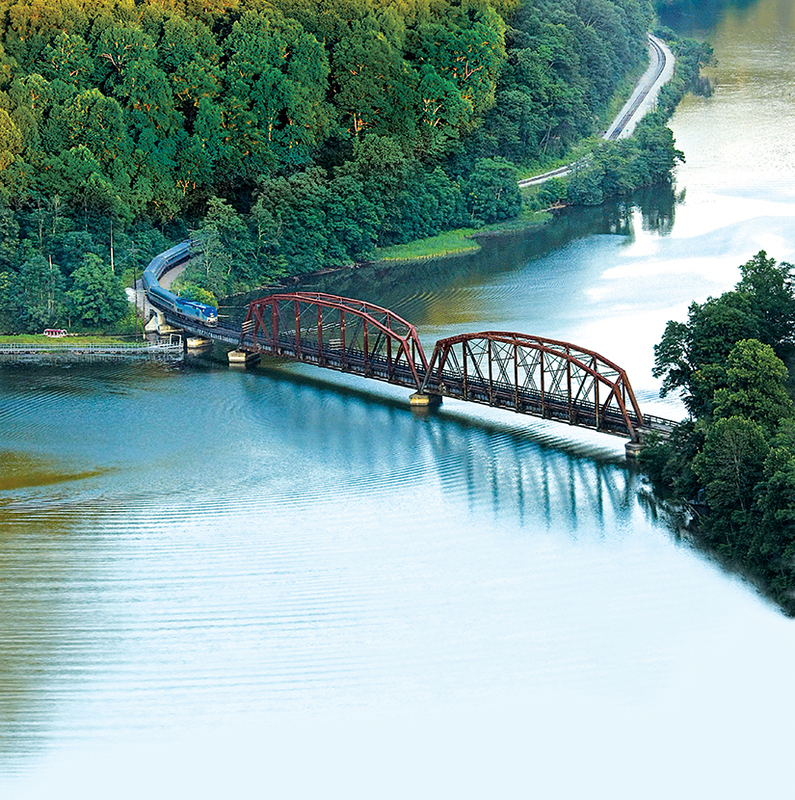 Doing the latter means taking in the scene from 851 feet above water—including the Cardinal Line tracks, which from that vantage point appear as thin, hatched lines hugging the river’s winding path. Fifty miles (or four train stops) southeast, Lewisburg is a gem of a free-spirited little town with a small historic district that provides space for a surprisingly big food scene. Which makes sense: The area was historically an agricultural hub, so it didn’t take the same hit as coal towns when the world switched preferred power sources. 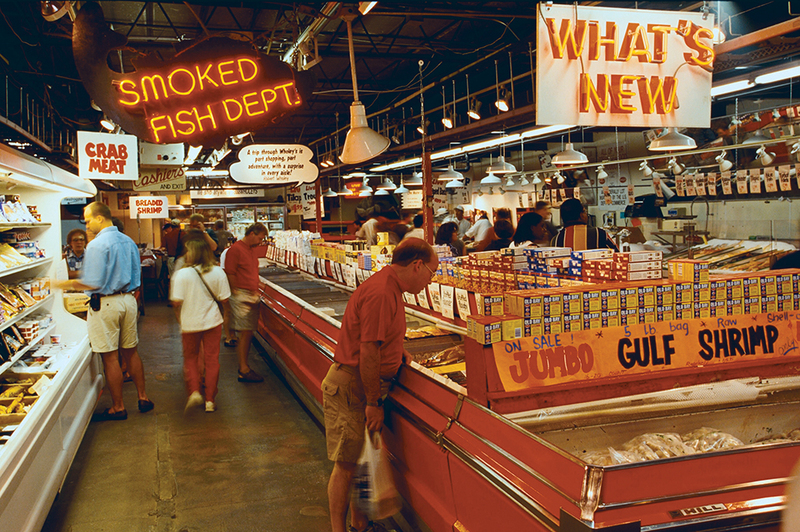 Being repopulated by hippies and back-to-landers in the ’70s also left its legacy. You won’t find hippies about town today, but you’ll benefit from their coming before you: farm-to-table food is the norm, and there’s a laid-back, artistic vibe throughout, including in the many boutique shops. Bella is a kitchenware-lover’s dream; Patina hawks artisan and vintage goods; Edith’s is basically a locally owned Whole Foods; Wolf Creek Gallery stocks brands like Free People and Frye; and Serenity Now Outfitters is packed with outdoor gear from Patagonia and Keen. Find shelter at the General Lewis Inn, a charming hotel built in 1929 from an 1834 homestead. It’s within easy stumbling distance of the French Goat, an upscale bistro that also excels at cocktails; Stardust Café, the place for local beef and perfection in the form of a flourless chocolate torte; and Wild Bean, a big, quirky community hub of a coffee shop. Greenbrier County is also home to The Greenbrier resort. Around the turn of the 19th century, people began coming to the spot from near and far to bathe in the healing waters of the sulphur springs. 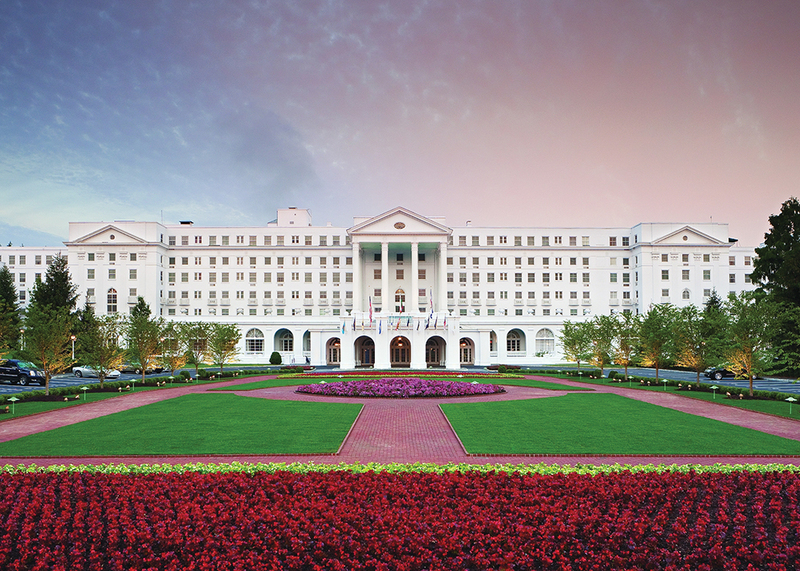 The Greenbrier in White Sulphur Springs. The draw has grown substantially, albeit less sulphur-based, as the resort now includes 710 rooms, 11,000 manicured acres, 14 restaurants and bars, plus golf courses and stables. An icon of design from the mind of Dorothy Draper in the 1940s, it’s big prints and bold colors all over—all continually refreshed by her protégé, Carleton Varney. The Greenbrier is also the site of an infamous, formerly secret Cold War–era underground bunker, built to house Congress in case of a nuclear attack, which guests can now tour. On the way: Call it the budget-and-time-sensitive way to explore the Canadian wilderness. The 17,371-acre landscape of Dolly Sods, part of the Monongahela National Forest in West Virginia, is primarily bog (marshy wetland) and heath (open areas of coarse grasses and small shrubs). But that shouldn’t make you think it’s flat: The elevation ranges from 2,500 to more than 4,700 feet with giant, jagged rock formations and wind-gnarled trees throughout—all of which you can explore on 47 miles of trails. A historic home, a vibrant arts scene, waterfalls worth hiking to, and global cuisine in the Blue Ridge Mountains. Asheville sits pretty in the Blue Ridge Mountains. 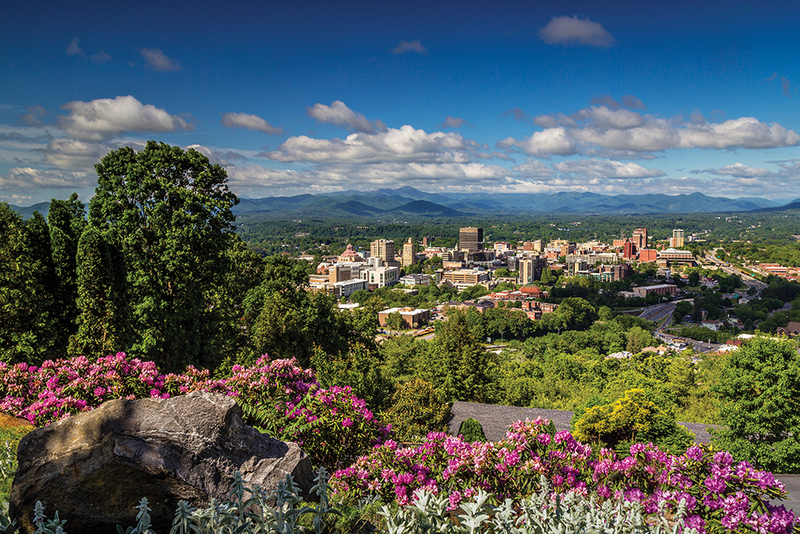 The best way to get insider intel in Asheville is by feasting on the knowledge of locals. So on your first night in town, grab a stool and dine at the bar. 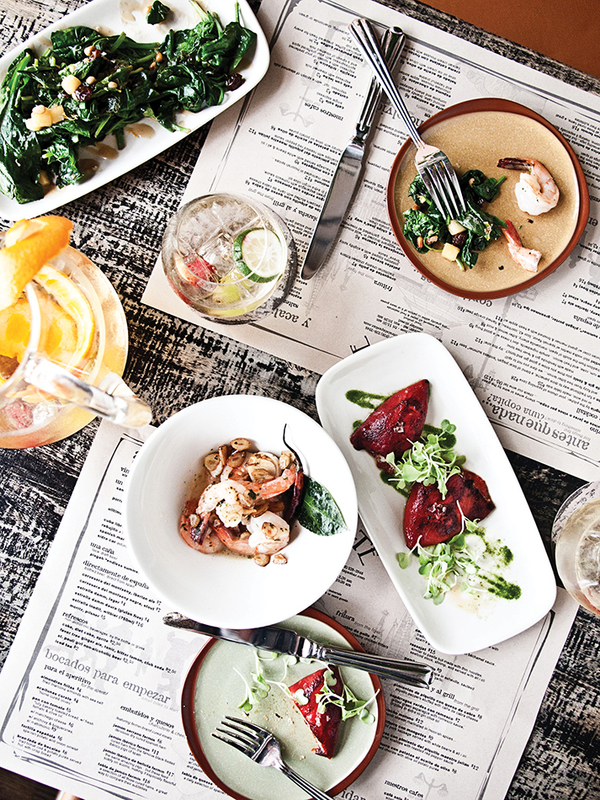 The Corner Kitchen in Biltmore Village makes an excellent starting point; well-informed patrons and staff at this cozy spot will gladly help curate your Asheville dining experience while you sip a glass of Avelada, a crisp Portugese vinho verde. If your dining companions happen to point you toward Cucina 24 or Cúrate, heed their advice. Cúrate serves Spanish tapas with a modern twist: the warm, Galician style octopus and fried eggplant with honey and rosemary are standouts. Cucina 24 plates some of the city’s freshest, local-est Italian cuisine, like rigatoni all’Amatriciana and creamy, housemade stracciatella (the cheese, not the gelato) with grilled broccoli and Calabrian chilies. Or dispense with restaurants altogether and take part in a Wild Food Foraging Adventure through No Taste Like Home, during which you’ll amble through forest and field on a guided tour, collecting edible berries, nuts, greens, seasonal mushrooms, flowers, and seeds. When touring the Biltmore in August, keep in mind that this American castle, built by the Vanderbilt family at the turn of the 20th century, lacks a key American comfort: air conditioning. Still, the house is worth every sweaty step, especially the kitchen—Downtown Abbey’s Mrs. Patmore and Daisy would have died for such space, and such a view! You want more walking? Head out of town to find stunning waterfall hikes, like the Catawba Falls trail at Pisgah National Forest, or Rainbow Falls at Gorges State Park. Chimney Rock at Chimney Rock State Park offers dramatic views from atop a 500-million-year-old rock tower. Downtown Asheville is awash in indie boutiques where you can find un-Google-able goodies to take home. Pop into Old North on Walnut for a discriminating selection of well-made men’s and women’s clothes, and Asheville Market Basket on Battery Park Avenue for colorful cottons for yourself, your table, and your bed. While you’re downtown, plan to spend some time (and money) at Tops For Shoes: If it’s trendy, a little edgy, and comfy, they have it. If you’re near downtown on the Lord’s day, reserve a spot at one of Rhubarb’s Family Tables, where they serve a three-course family style supper at 6:30 every Sunday. 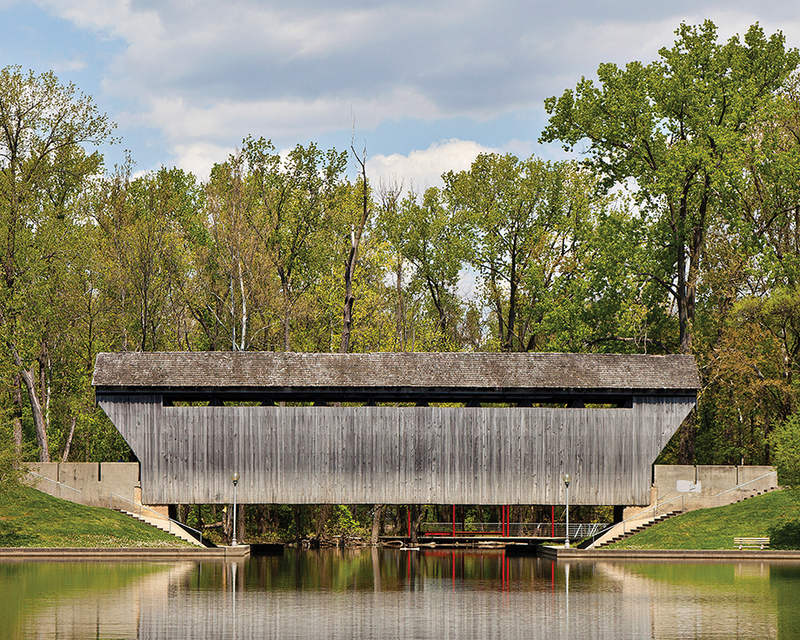 Visit a dreamy Midwestern town where the past is the future. 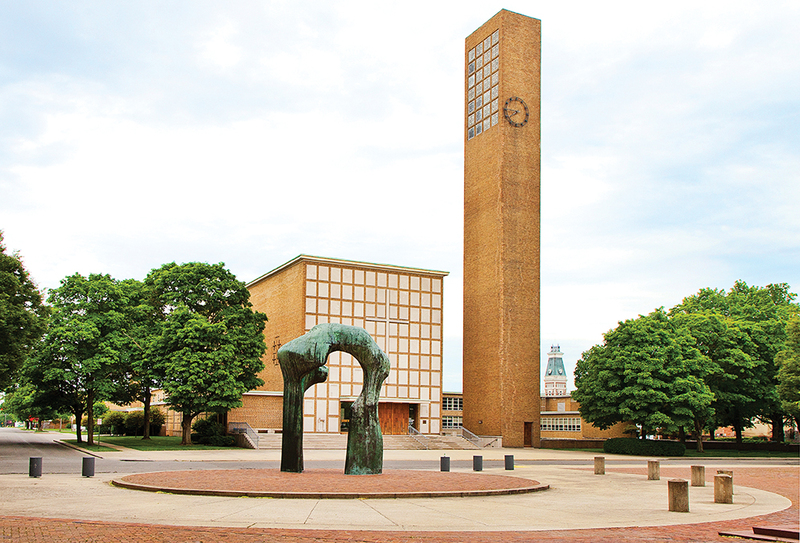 The First Christian Church in Columbus, Indiana, with a sculpture by I.M. Pei. Photograph by Hadley Fruits for Exhibit Columbus. How to do the Motor City bop. Mark Stryker was an arts reporter and critic at the Detroit Free Press from 1995 to 2016. The author of the upcoming Made in Detroit: Jazz From the Motor City (University of Michigan Press) has a few tips on making the most of your weekend. How to survive 150 (or even just 50) miles on in-line skates. Still got that pair of Rollerblades? In September, Montana outfitter Zephyr Adventures leads a group around Dayton, Yellow Springs, and Xenia: five days and up to 150 miles on the Great Miami River, Mad River, Creekside, and Little Miami Scenic trails. Zephyr’s alumni ambassador and tour operations specialist Kristin Keys explains. People still do that? Yes and no. Zephyr was founded in 1997 as Zephyr Inline Skate Tours, but these days the company is more focused on biking, hiking, and food, wine, and beer tourism. This trip (and one in June) takes Zephyr back to its roots in celebration of the company’s 20th anniversary. Why Ohio? It’s very skater-friendly, meaning paved, flat, and beautiful, with lots of trees for both scenery and potentially hotter temperatures. “And there are miles and miles of trails,” Keys says—340, in fact: the Miami Valley system is the largest paved-trail network in North America. Rivals? Sure. But where we have Skyline, they have haluski. Which is better? Decide for yourself. Eat, drink, and pedal your way through Lexington’s horse country. Taking a break on the Savory Cycle ride. We’ve just banked into a narrow, uphill lane when the rear derailleur on the bike in front of me makes a sound like a spoon in a garbage disposal and explodes, spewing bits of metal all over the road. Our small peloton skids to a halt and right away, Stuart Morrison, an English import visiting the Bluegrass State by way of Tennessee, takes charge, urging us up the lane away from what he recognizes as a dangerous blind turn even on a sleepy Sunday morning in the Lexington countryside. Luckily the next driver to come around the bend is not a church-bound local but rather Stuart’s daughter, Stevie. No sooner has she pulled the sag wagon over—cyclist-speak for support-and-gear van—than James Lin and his wounded bike are spirited inside, and the rest of us are off and rolling the 15 or so miles to the next rest stop. 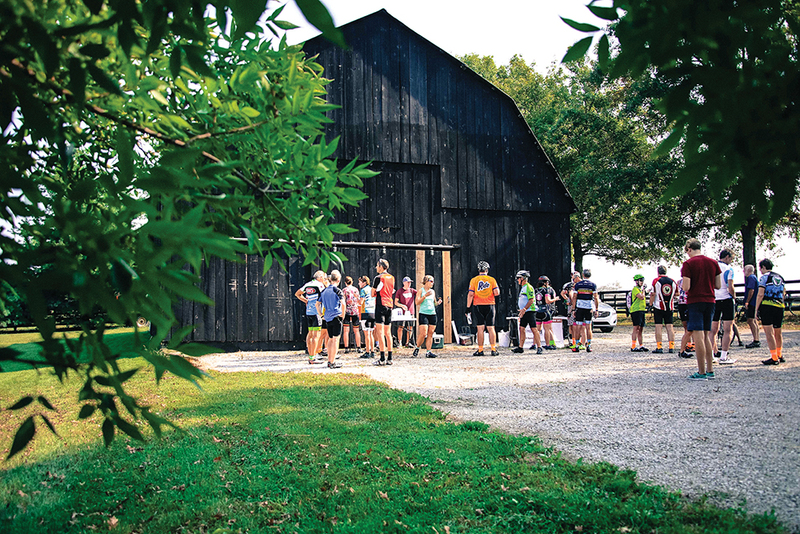 This is Savory Cycle, a gourmet benefit group ride through the heart of Lexington’s horse country that takes place on the last full weekend every September. “Gourmet” because it includes meals made by James Beard Award–nominated Chef Ouita Michel and her team of culinary experts at Holly Hill Inn, who also ensure that morning and afternoon rest stops are packed with scratch-made energy bars, baked goods, and drinks. As for the “benefit” part, proceeds from the ticket price go to Lexington’s Broke Spoke, a volunteer-run community bike shop. Savory Cycle has two routes. The “Five-course” ride, a “metric century” (100 kilometers, or about 62 miles), meanders along country roads lined with stone walls and horse pasture, with morning and afternoon rest stops. The less ambitious 25-mile “Amuse Bouche” goes straight from Midway’s charming Holly Hill Inn, where both courses begin and end, to lunch at Woodford Reserve and back again. Lunch at Woodford Reserve Distillery for both routes comes with a chance to walk the distillery grounds. Savory Cycle is the brainchild of Mason Colby, a French translator who also happens to be an avid cyclist. Colby wanted to do something to benefit Broke Spoke, where he has helped out in the past, but, because of young kids and work, can’t regularly volunteer. When Colby travels to France to meet with clients, he retrieves a venerable Peugeot kept stashed in a friend’s Burgundy garage and embarks on day-long rides, stopping for coffee, croissants, or a glass of wine. It’s an experience, he says, that is very much a part of French society, and a perfect way to enjoy the countryside and cuisine. So in 2014, with help from other bluegrass-based cycling enthusiasts, Savory Cycle was born. The antithesis of competitive sweat fests, Savory is all about taking it easy and savoring the landscape—Kentucky-grown grains, fruits, honey, farm-raised meats, and vegetables included. The day begins with breakfast on Holly Hill Inn’s broad front porch. Colby strums a banjo as riders munch on mini biscuit sandwiches, muffins, and fresh fruit. During breakfast I stroll the lawn, admiring the bikes. Among the shining alloy, titanium, and carbon-fiber speed machines stand plenty of sticker-plastered, scratched-and-dented commuter “frankenbikes” typically assembled by younger cyclists in community shops like Broke Spoke. While benefit rides tend to be the domain of well-off folk with fancy bikes, Savory is a melting pot, and with a recommended pace of just 13 miles per hour, suitable for both the newbie and seasoned randonneur. If eating then biking 60 miles sounds like a recipe for stomach cramps, fear not. Chef Ouita Michel’s crew includes Woodford Reserve Chef de Cuisine and avid cyclist Nat “Naytron” Henton, who brings first-hand knowledge of what the distance cyclist needs to eat and drink and when. The mid-afternoon rest area is stocked with coolers of black- and blueberry-lemonade and sugary snacks in the form of Woodford Reserve’s famous corn cookies. These the Lycra-clad veterans of the ride insist I have to try. They’re made, Chef Michel tells us, from local corn so as to conjure the landscape and compliment bourbon’s 51 percent corn content, an ethos reflected in all of the food she prepares for the ride as well as at Holly Hill Inn and Woodford Reserve Distillery, where she is owner and chef-in-residence, respectively. “We deliberately connect to foods that are grown in that landscape,” she says. From the vantage of a bicycle saddle in the slanting September sun, the horses we pass seem conscious that they are the stars in this universe of green undulating grass neatly fenced with black board and leaning stone. They’re curious about the riders, whinnying and gamboling as we pass, occasionally taking off beside us and impossible to keep pace with. There are long hills where you drop into low gear and pump your way slowly to the top then enjoy the blast of hay-scented air as you accelerate downhill on roads cut into Kentucky’s famed “karst” of limestone layered like a cake. It’s a hot, dry day and the ride unfolds as a series of conversations. Corbin Little, an English teacher who lives in Lexington, tells me she’s a sucker for gourmet rides. For her, Savory stands out for its lack of pretension and a sense of camaraderie deepened by the easy cadence. Fall colors are just beginning to emerge and on the final, relatively flat leg, the road is strewn with huge yellow tobacco leaves. Grasshoppers throw themselves into our spokes, as the residents of Woodford County wave from the shade. Even Lin manages to finish the ride, his derailleur having been replaced during lunch by the ride mechanic, Adam, from Lexington’s Broomwagon Coffee + Bikes. The pungent scent of barbecued brisket and strains of a string band tuning up greet us as we coast back into Holly Hill Inn’s driveway. Dinner is almost ready, but first there are amber tumblers of bourbon and cold cans of beer to hoist.